Want to give your customers and employees affordable, high quality colour documents on demand? You can with the Aficio SG 2100N/SG 3110DN/SG 3110DNw. These innovative GELJET printers have a small footprint, full front access and easy connectivity including WiFi (SG 3110DNw). 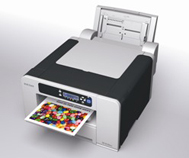 They feature Ricohs fast-drying Liquid Gel technology to simplify colour printing in shops, businesses and home offices everywhere.